By Lee Holder, D.O., Steven Lewis, M.D., Erik Abrames, M.D, Ely A. Wolin, M.D. 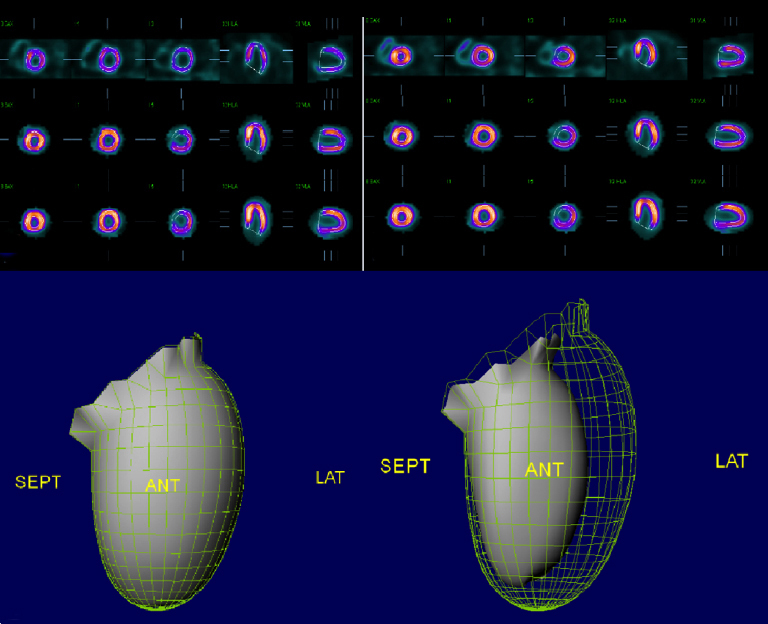 Myocardial perfusion imaging (MPI) allows for noninvasive evaluation of coronary artery disease (CAD) by detecting flow-limiting disease and providing risk stratification.1-3 Despite a recent decline in popularity likely due to changing physician behavior, it remains the most frequently ordered nuclear medicine exam.4 It is important for any provider reading nuclear medicine studies to have a firm understanding of MPI acquisition and interpretation. This review of single photon emission computed tomography (SPECT) MPI, includes its indications, sensitivity and specificity, radiopharmaceuticals, protocols, and an approach to image interpretation with illustrative cases. MPI is performed to evaluate for the presence and severity of CAD by detecting flow-limiting disease, risk-stratifying patients, and assessing and quantifying patient risk. It is most frequently ordered for perioperative cardiovascular evaluation and chest pain. The American College of Radiology (ACR) appropriateness criteria is another useful resource for reviewing appropriate study utilization. According to these criteria, SPECT MPI is usually appropriate in the clinical setting of chest pain suggestive of acute coronary syndrome in stable patients with no ischemic electrocardiogram (ECG) changes and negative lab markers.7 A rest-only SPECT has been shown to have a high negative predictive value for acute coronary syndrome during active chest pain, although it is less sensitive than stress SPECT after the pain has resolved.7,8 SPECT MPI is also usually appropriate for use in chronic chest pain with a high probability of CAD,9 chronic chest pain with a low to intermediate probability of CAD,10 and in dyspnea with a suspected cardiac origin.11 The ACR has given a may be appropriate grading to the use of SPECT MPI in acute nonspecific chest pain in a setting of low probability of CAD.12 This is most appropriate when there is a need to exclude CAD as a potential source in the setting of negative cardiac enzymes and negative or equivocal ECG findings. A usually not appropriate grade applies to the use in asymptomatic patients with a low to intermediate risk of CAD but a may be appropriate grade applies in asymptomatic patients with a high risk of CAD.13 Table 1 is a brief review of these guidelines. Historically, thallium-201 (Tl-201) was used in nuclear medicine to image the myocardium. Tl-201 is a potassium analogue that decays primarily via electron capture to mercury-201 emitting 69-81 KeV x-rays.18 It is actively transported into myocardial cells by sodium-potassium pumps. Thallium uptake is directly proportional to perfusion of the myocardial cells. After initial distribution, Tl-201 redistributes throughout the myocardium as a result of cellular washout and continued cellular uptake. Ischemic regions of myocardium demonstrate delayed washout, but eventually equalize with the remainder of the myocardium. Regions that do not show redistribution are considered fixed defects. With a relatively long 73-hour half-life, Tl-201 is administered in low dosages, 1.5-2.0 mCi at both rest and stress.19 With such low dosage and low energy photons, Tl-201-based imaging produces counting statistics inferior to those provided by newer agents, which have mostly replaced thallium for MPI (Figure 1). 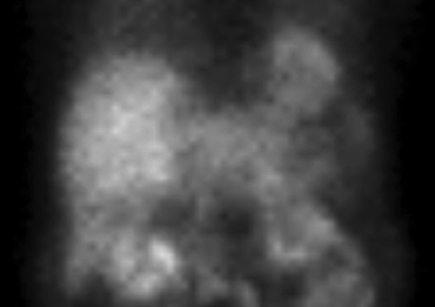 Tl-201 remains useful in viability imaging. Twenty-four-hour delayed redistribution into a fixed defect suggests viable, hibernating myocardium, which may respond to revascularization. Before any stress test, the patient should be NPO for 4 to 6 hours to reduce blood flow to the bowel and liver. Calcium channel blockers and beta-blockers should be discontinued for 48-72 hours, and long-acting nitrates discontinued for 12-24 hours. Caffeine should not be consumed for 1 day prior to the exam.18 Myocardial stress is achieved either with an exercise treadmill test (ETT) or pharmacologic agents. ETT involves a multistage exercise test based on a Bruce or modified Bruce protocol, during which the speed and grade of the treadmill are gradually increased. The modified Bruce protocol starts with no slope, vs. 10% for the Bruce protocol, and the speed and slope are increased at a slower rate. The patient must achieve a heart rate of at least 85% of their predicted maximum heart rate (220 beats/minute [min] minus the patient’s age) for an ETT to be adequate. The radiopharmaceutical is injected at peak stress and the patient should continue to exercise for an additional minute. Pharmacologic stress can be used if the patient is unable to perform exercise or an ETT must be terminated before the patient’s heart rate reaches 85% of the maximum predicted. Other indications for a pharmacologic stress test include acute coronary syndrome, hypotension, a left bundle branch block (LBBB), or severe congestive heart failure. A patient with LBBB may have false positive results from an exercise stress test, typically an artifactual septal defect. Non-nitrate vasodilators such as dipyridamole, adenosine, and regadenoson can be used for pharmacologic stress. The resultant vasodilation, typically 3 to 5 times baseline, tests coronary flow reserve.26 Minor side effects are common and include flushing, headache and dyspnea. Regadenoson (Lexiscan) is the most frequently used agent. It is a selective A2A receptor agonist that results in coronary vasodilation with fewer side effects, injected as a 400µg bolus over 10 seconds.26 Non-nitrate vasodilators should not be used in patients with second- or third-degree heart block. Caution should also be used in patients with reactive airway disease as these agents can cause severe bronchospasm. Dobutamine has also been used as a pharmacologic stress agent. Dobutamine is a synthetic catecholamine that acts on alpha- and beta-adrenergic receptors, which increase cardiac work through positive inotropic and chronotropic effects. Dobutamine can be used as an alternative to vasodilator therapy in cases of severe asthma. Initial infusion dose is 5 ug/kg/min over 3 min. The infusion is then increased to 10 µg/kg/min for another 3 minutes. The infusion rate can be increased to a maximum of 40 µg/kg/min every 10 minutes.26 The radiopharmaceutical is then injected 1 minute after the maximum tolerable dose. Frequent side effects include chest pain and arrhythmias. Due to the physiologic redistribution of Tl-201, imaging starts with the stress portion of the examination. While Tl-201 can be injected at both stress and rest, many will use a single injection protocol. This entails an injection of around 4 mCi of Tl-201 at peak myocardial stress with the poststress images obtained as soon as heart rate returns to normal. If the stress images are abnormal, redistribution images are obtained around the 4-hour mark. Viability images can be obtained at 24 hours if there is a fixed defect, and determination of viability will assist clinical management. With the Tc99m-based mitochondrial imaging agents, the primary options are using either a 1 or 2-day protocol. The 1-day protocol is primarily used, as it is more convenient for patients and more efficient. The 2-day protocol allows for higher administered dosage at rest, which can be advantageous particularly in obese patients, and offers the possibility of stress-only imaging. The 1-day protocol involves obtaining a rest study and a stress study on the same day. The patient receives 2 doses of radiopharmaceutical approximately 1.5 to 2 hours apart.26 The rest study is performed first with images obtained generally 30 to 60 minutes after injection of 8-10 mCi of Tc-99m sestamibi or tetrofosmin. After 1.5 to 2 hours, allowing sufficient clearance of the rest dose, the patient undergoes the stress portion of the study. During peak stress a second dose of radiopharmaceutical is administered, typically 25 to 30 mCi. The patient is then imaged quickly (15-20 min) after radiopharmaceutical administration. The larger second dose provides higher quality images, generally favored with the stress portion of the examination, especially for gated images. In large patients, a small dose of radiopharmaceutical can result in poor image quality and nondiagnostic images due to increased attenuation. In these cases, a 2-day protocol can be used to allow for higher administered activity for both the rest and stress portions.26 The larger doses must be separated by a day to ensure counts originate from the desired injection. For a 2-day protocol, the stress portion is performed on the first day. The Tc-99m radiopharmaceutical is injected at peak stress and the patient is imaged quickly (15-20 min). If the stress portion of the study is normal, no further imaging is necessary. If the stress portion of the study is abnormal, the patient returns the next day to receive of a second dose of Tc-99m radiopharmaceutical at rest with images obtained 30-60 min after injection. SPECT imaging can utilize either a 180° or 360° acquisition, with 32 or 64 stops or continuous acquisition. For nonattenuation-corrected imaging, 180° is preferred. The patient is usually supine, unless using a dedicated cardiac chair, with arms up to position outside the field of acquisition. Prone imaging can be helpful for patients with a lot of attenuation. The use of attenuation correction is occasionally essential, such as in patients with recent pacemaker placement who cannot put their arm up out of the field of view. If attenuation correction is used, it is imperative to evaluate both the corrected and uncorrected data as the correction software can create artifactual perfusion defects. The interpretation of SPECT MPI includes four broad categories: raw data, qualitative analysis, quantitative analysis, and evaluation of motion and function. Raw data images are generally viewed as rotating cinematic (cine) images. These images allow the interpreter to evaluate radiotracer distribution, and assess for attenuation, motion or interfering splanchnic activity. Normal physiologic distribution of the Tc-99m-based mitochondrial imaging agents includes activity within the heart, liver, gallbladder, small bowel, kidneys, bladder and sometimes the stomach. Mild uptake may be seen within the lungs and skeletal muscle as well, particularly if an exercise stress protocol is used. Uptake within the RV is normal, especially on stress imaging; however, if RV activity approaches the left, it is abnormal and may indicate RV strain. Any uptake outside of these normal structures requires attention. Particular attention should be paid to the axillary nodes and breast tissue, as the mitochondrial agents are nonspecific tumor imaging agents. In fact, Tc99m-sestamibi is used for breast-specific gamma imaging. Any breast uptake should be correlated with mammography. Uptake in the axillary nodes is often from radiopharmaceutical extravasation at the injection site, but can be seen with metastatic disease and may warrant further workup. A right upper quadrant ultrasound should be recommended if there is no uptake within the gallbladder in a patient without prior cholecystectomy (Figure 2). Identifying attenuation on the raw cine images may aid problem-solving for defects noted during qualitative analysis. 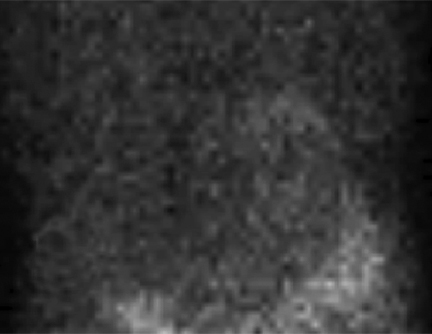 It is particularly helpful to note whether a shift in attenuation occurs between the rest and stress images as this may result in an artifactual reversible defect. Breast tissue leads to attenuation on most female patients, usually resulting in an anteroseptal defect on qualitative review. The diaphragm and lateral chest wall also frequently attenuate, resulting in defects involving the inferior base of the heart. Also, the interpreter should be aware of external devices such as pacemakers that may overlie portions of the heart and mimic perfusion defects. SPECT computed tomography (CT) can be helpful as the CT component allows for attenuation correction of the SPECT data (Figure 3). At our institution, we perform the examination as a SPECT CT if the patient has a high BMI or is unable to raise both arms above the head. Repeating the stress images in the prone position is also sometimes helpful, as a true perfusion defect will not shift. 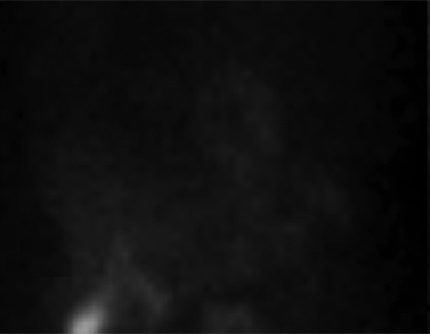 Motion correction should be applied during image processing if there is significant motion. Assessment after correction should show no significant cardiac motion. Splanchnic activity projecting adjacent to the heart—usually bowel or hepatobiliary activity—may limit evaluation. This “gut crosstalk” (Figure 4) usually affects the inferior wall. The high activity within the adjacent organs may either artificially add or subtract counts from the myocardium. Falsely elevated counts can mask a true defect, while falsely decreased counts can create a false defect.3 Prone positioning may increase distance between abdominal viscera and the heart, possibly limiting gut crosstalk, and adding a small exercise component to pharmacologic stress may decrease splanchnic activity. The most important way to limit gut crosstalk is to allow sufficient time before imaging to allow activity to clear.3 At some facilities, patients drink a carbonated beverage prior to imaging to help clear gastric activity. The raw SPECT data is processed to create image slices that are parallel and perpendicular to the long axis of the heart for qualitative analysis. The horizontal long axis (HLA) is parallel to the inferior wall giving the best view of the septum and lateral wall; the vertical long axis (VLA) is parallel to the septum giving the best view of the anterior and inferior walls; the short axis (SA) is perpendicular to the long axes and parallel to the base (Figure 5). Evaluating these images for perfusion abnormalities provides the primary information clinicians need. The poststress data is the most important. If the stress data is normal, there is no evidence of ischemia or infarct. The primary purpose of rest images is to provide specificity to a stress defect. The images can be evaluated using multiple color schemes, each of which comes with an inherent associated sensitivity and specificity. Determining the color scheme is a personal preference, but requires an understanding of the statistics associated with the choice. If present, stress perfusion defects are described by size, severity, location, extent and reversibility. Size is the amount of LV myocardium involved, described as small, moderate or large, equating to < 10%, 10% to 20%, or > 20% of myocardium. Severity is described by the percentage of counts compared to the most active area of myocardium. As the images are normalized to the “hottest” pixel, this is one of the ways “gut crosstalk” can affect interpretation. Masking the data to exclude extra-cardiac activity can help, but it is impossible to exclude activity immediately adjacent to the heart without losing real data. At our institution, anything visibly within 75% to 100% of the hottest pixel is considered normal. Mild decrease is 50% to 75%, moderate is 25% to 50%, and severe is between 0% to 25%, with 0% considered complete. Location refers to the ventricular segments/walls involved, and extent describes which slices within the segment are involved, typically broken down into base, mid slices, distal/apical slices and apex. Rest images are needed to determine reversibility, which in turn, determines the primary differential. When evaluating for reversibility, it is imperative to ensure that the rest and stress data are similarly aligned. A fixed defect is a perfusion defect present at stress and rest. Primary differential for a fixed defect includes scarring from infarction, chronically ischemic areas called hibernating myocardium, or attenuation. Attenuation defects generally are worse at rest than stress (because approximately 3 times the dosage is given at stress with a 1-day protocol), are in a distribution that matches known areas of attenuation, should be seen on the raw images, and will have normal motion. 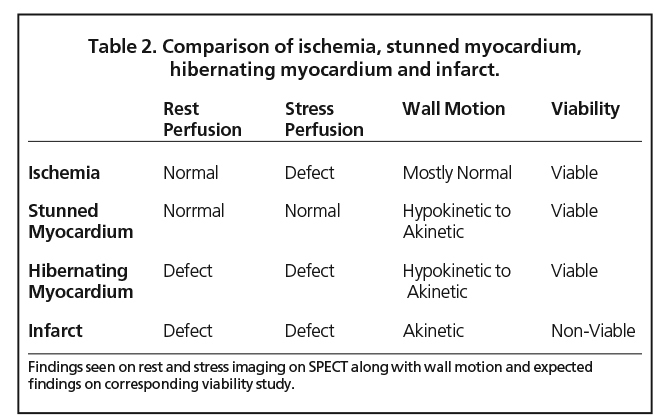 Infarction and hibernating myocardium will look identical on SPECT MPI (Figure 6). A separate viability study can differentiate, if it is clinically necessary, as hibernating myocardium will respond to revascularization (Table 2). A poststress perfusion defect that improves at rest is called reversible, and is concerning for stress-induced ischemia (Figure 7). As discussed, shifting attenuation leading to an area of myocardium being attenuated on the poststress images but not the rest images is a possible cause for a false positive. Ensuring the defect matches a vascular distribution and thorough evaluation of the raw data can help prevent this pitfall. SPECT-CT with attenuation correction is also an option. Areas of reversibility within a mostly fixed defect should be reported as such. An example is a fixed defect with reversibility along the margins representing an infarct with peri-infarct ischemia (Figure 8). Computer software can help provide quantitative analysis of myocardial perfusion. Most programs use a 17-segment polar map of the LV to help identify specific areas of perfusion abnormality. The images are compared to a normalized control database. A 0-4 scoring system is used for each segment, with 0 being normal and 1-4 given for mildly decreased to completely absent counts. This scoring applies to both stress and rest data, and the numbers in each polar map are added to provide the SSS and SRS. SSS can help assess patient risk of a significant cardiac event. SSS of ≤ 3 is normal, 4-7 is low risk, 8-12 is intermediate risk, and ≥ 13 is high risk.21 The SDS is assessed by subtracting the SRS from the SSS. Any segment with an SDS of ≥ 2 is considered reversible and concerning for ischemia (Figure 9). We typically give more weight to our qualitative analysis if the quantitative results are discordant, as the quantitative data relies on appropriate contouring and is easily manipulated. With the addition of gated images, LV motion and function can be analyzed. We only obtain gated images poststress, as the statistics are better due to the higher administered activity, and the patient is already physiologically at rest at the time of acquisition. Normal LV motion results in at least 20% shortening of the long axis and 40% shortening along the short axis, with the anterior wall moving the most and the apex moving the least.18 The septum should thicken and move toward the center. Cine analysis of slices from the 3 axes of the gated images should show all walls thickening and brightening with systole. The basal one-third of the septum is membranous and should not be mistaken for a defect or motion abnormality. Apical thinning, which is anatomically normal, may also mimic a defect. If wall motion is normal, the ventricle thickens normally, and a small defect is evident on rest and stress views, it is likely normal.21 Most software will also create a 3D map of the left ventricle, highlighting the extrapolated chamber throughout the cardiac cycle. Wall motion is either normal, hypokinetic, akinetic, or dyskinetic. Hypokinesis can be seen with areas of ischemia if the patient has not fully recovered from stress. Akinesis is usually associated with infarction or hibernating myocardium. Dyskinesis, outward movement during systole, suggests aneurysm formation at the site of transmural infarction. After coronary artery bypass grafting (CABG), anteromedial deviation of the heart—commonly referred to as post-CABG kinetics—can be seen due to interruption of the normal fascial bands. The 3D renderings of the chamber will resemble septal hypo- or akinesis, but review of the slices will show the septum normally thickening and increasing in counts (Figure 11). A “septal bounce,” or paradoxical movement of the septum inward during diastole, is nonspecific but may appear with LV restriction (constrictive pericarditis, tamponade, or restrictive cardiomyopathy) or with LBBB (Figure 12). If no LBBB is seen on ECG, further analysis is in order. Calculated LVEF is usually provided, with 50% to 70% being normal. This is not as accurate as radionuclide ventriculography. 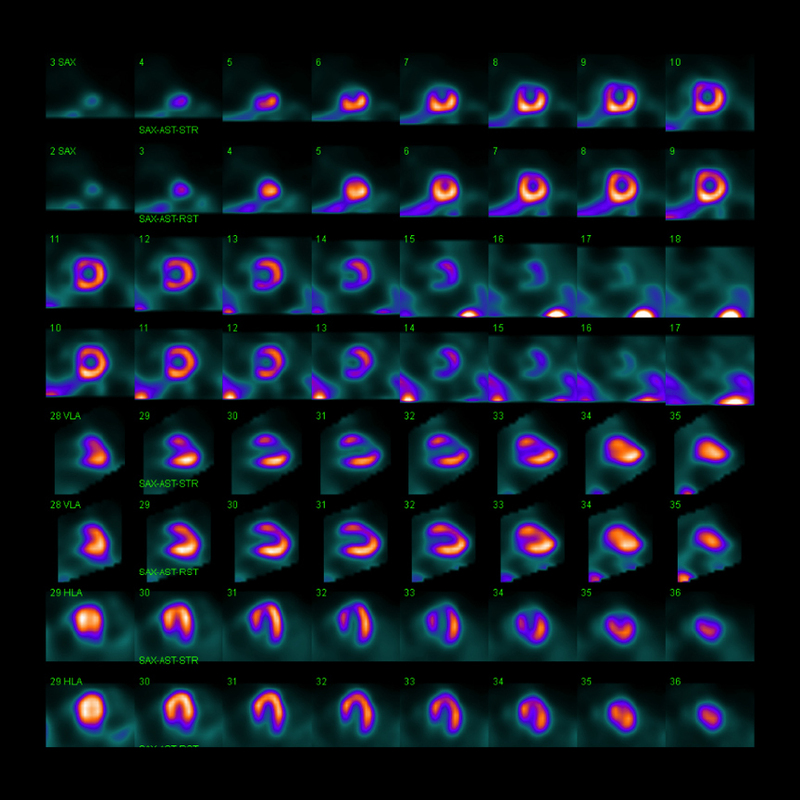 SPECT MPI remains a widely used modality to analyze myocardial perfusion. It is particularly useful in identifying flow-limiting stenoses and for risk stratification. Use of appropriate protocols and radiopharmaceutical dosage is paramount in obtaining diagnostic quality images. An ideal approach to image interpretation includes evaluation of raw data, qualitative analysis, quantitative analysis, and cardiac motion and function. Accurate interpretation requires a working knowledge of radiopharmaceutical biodistribution, cardiac physiology, as well as common pathologies, pitfalls, and artifacts. Ben-Haim S, Murthy VL, Breault C, et al. Quantification of myocardial perfusion reserve using dynamic SPECT imaging in humans: a feasibility study. J Nucl Med 2013;54:873-879. Slomkaa P, Xua Y, Bermana D, et al. Quantitative analysis of perfusion studies: strengths and pitfalls. J Nucl Cardiol 2012;19(2):338-346. 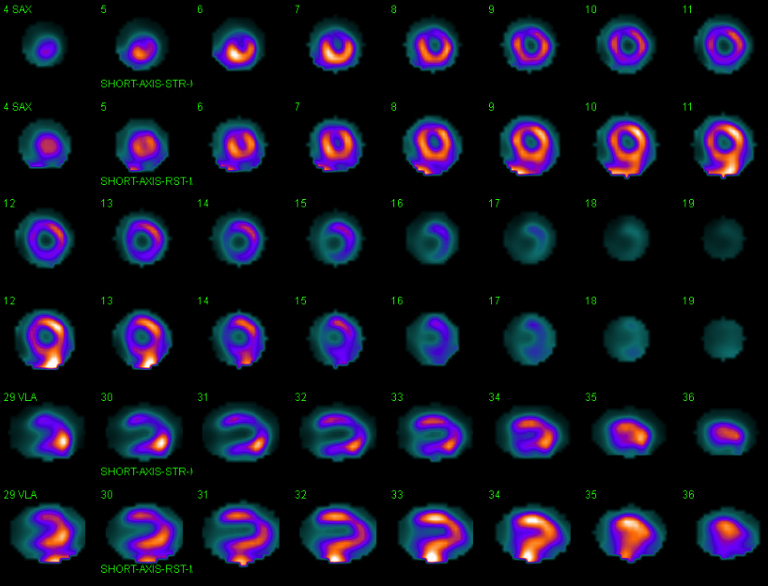 Burrell S, MacDonald A. Artifacts and pitfalls in myocardial perfusion imaging. J Nucl Med Technol 2006;34:193-211. McNulty EJ, Hung Y, Almers LM, et al. 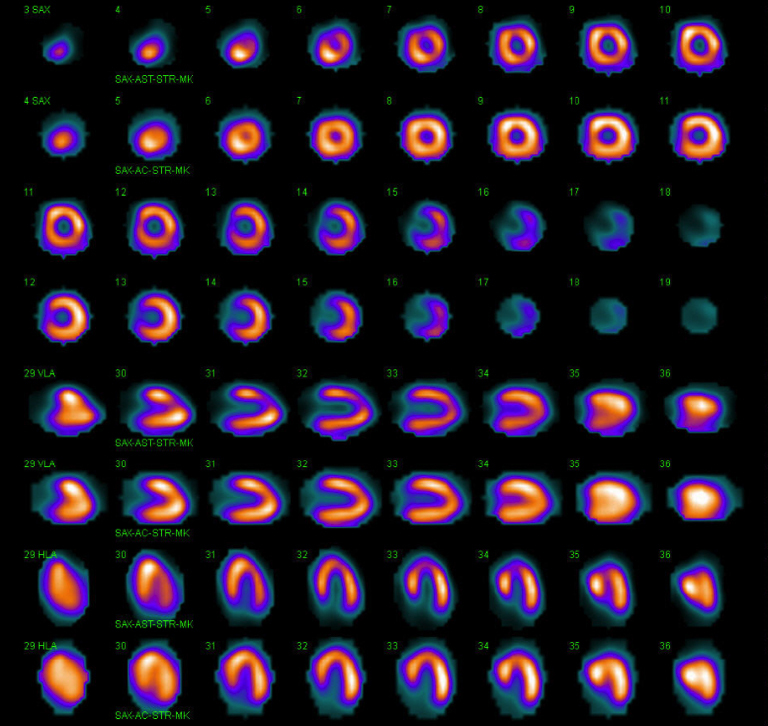 Population trends from 2000-2011 in nuclear myocardial perfusion imaging use. JAMA 2014;12:1248-1249. Harafuji K, Chikamori T, Kawaguchi S, et al. Value of pharmacologic stress myocardial perfusion imaging for preoperative risk stratification for aortic surgery. Circ J 2005;69:558-563. Fleisher LA, Fleischmann KE, Auerbach AD, et al. 2014 ACC/AHA Guideline on Perioperative Cardiovascular Evaluation and Management of Patients Undergoing Noncardiac Surgery: Executive Summary. J Am Coll Cardiol 2014:64(22)e77-e137. Mammen L, Abbara S, Dorbala S, et al. American College of Radiology ACR Appropriateness Criteria. Chest pain suggestive of acute coronary syndrome. https://acsearch.acr.org/docs/69403/Narrative/. American College of Radiology. Accessed February 17, 2016. Uliel L, Mellnick VM, Menias CO, et al. Nuclear medicine in the acute clinical setting: indications, imaging findings, and potential pitfalls. RadioGraphics 2013;33:375-396. Earls JP, White RD, Woodard PK, et al. Chronic chest pain—high probability of coronary artery disease. https://acsearch.acr.org/docs/69405/Narrative/. American College of Radiology. Accessed February 17, 2016. Woodard PK, White RD, Abbara S, et al. Chronic chest pain—low to intermediate probability of coronary artery disease. https://acsearch.acr.org/docs/69337/Narrative/. American College of Radiology. Accessed February 17, 2016. Abbara S, Ghoshhajra B, White RD, et al. Dyspnea—suspected cardiac origin. https://acsearch.acr.org/docs/69407/Narrative/. American College of Radiology. Accessed February 17, 2016. Hoffmann U, Akers SR, Brown RKJ, et al. Acute nonspecific chest pain—low probability of coronary artery disease. https://acsearch.acr.org/docs/69401/Narrative/. American College of Radiology. Accessed February 17, 2016. Earls JP, Woodard PK, Abbara S, et al. Asymptomatic patient at risk for coronary artery disease. https://acsearch.acr.org/docs/3082570/Narrative/. American College of Radiology. Accessed February 17, 2016. Wolk MJ, Bailey SR, Doherty JU, et al. ACCF/AHA/ASE/ASNC/HFSA/HRS/SCAI/SCCT/SCMR/STS 2013 multimodality appropriate use criteria for the detection and risk assessment of stable ischemic heart disease: a report of the American College of Cardiology Foundation Appropriate Use Criteria Task Force, American Heart Association, American Society of Echocardiography, American Society of Nuclear Cardiology, Heart Failure Society of America, Heart Rhythm Society, Society for Cardiovascular Angiography and Interventions, Society of Cardiovascular Computed Tomography, Society for Cardiovascular Magnetic Resonance, and Society of Thoracic Surgeons. J Am Coll Cardiol. 63(4):380-406. Jaarsma C, Leiner T, Bekkers SC, et al. Diagnostic performance of noninvasive myocardial perfusion imaging using single-photon emission computed tomography, cardiac magnetic resonance, and positron emission tomography imaging for the detection of obstructive coronary artery disease: a meta-analysis. J Am Coll Cardiol 2012; 59:1719-1728. Murthy VL, Di Carli MF. Non-invasive quantification of coronary vascular dysfunction for diagnosis and management of coronary artery disease. J Nucl Cardiol 2012;19:1060-1072. Hage FG, Aljaroudi WA. Review of cardiovascular imaging in The Journal of Nuclear Cardiology in 2014: Part 2 of 2: Myocardial perfusion imaging. J Nucl Cardiol 2015;22:714-719. Mettler FA, Guiberteau MJ. Essentials of Nuclear Medicine Imaging 6th Edition. Philadelphia: Elsevier; 2012. Bailey IK, Griffith LS, Rouleau J, Strauss HW, Pitt B. Thallium-201 myocardial perfusion imaging at rest and during exercise. Circulation 1977;55(1):79-87. Husain SS. 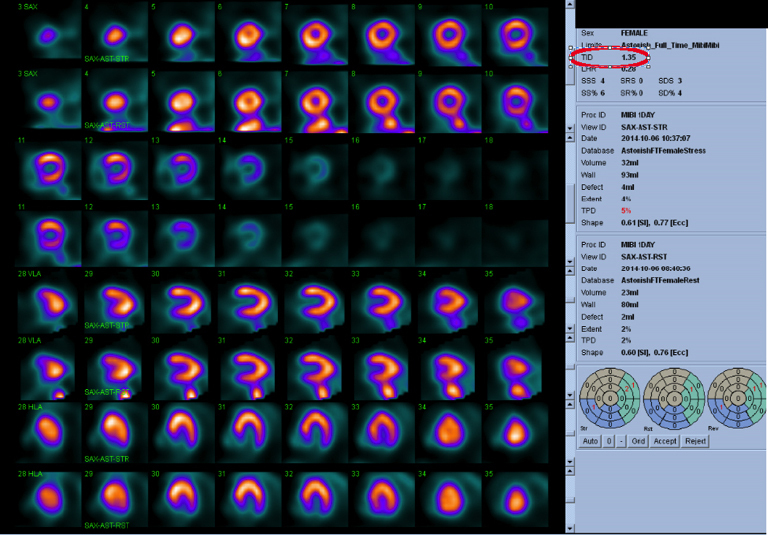 Myocardial perfusion imaging protocols: is there an ideal protocol? J Nucl Med Technol 2007;35:3-9. Dvorak RA, Brown RKJ, Corbett JR. Interpretation of SPECT/CT myocardial perfusion images: common artifacts and quality control techniques. RadioGraphics 2011;31:2041-2057. Tc-99m sestamibi/tetrofosmin stress-rest myocardial perfusion scintigraphy. University Health Shreveport. http://www.sh.lsuhsc.edu/raddept/pdf/sec18/Rad%20Proc%2018.8.5.5.pdf. Accessed February 20, 2016. Cardiolite kit for the preparation of technetium tc99m sestamibi for injection. Lantheus Medical Imaging. http://www.cardiolite.com. Accessed February 20, 2016. Myoview 30 mL kit for the preparation of Tc99m tetrofosmin for injection. GE Healthcare. Medi-Physics, Inc. http://www3.gehealthcare.com. Accessed February 20, 2016. DePuey, GE. 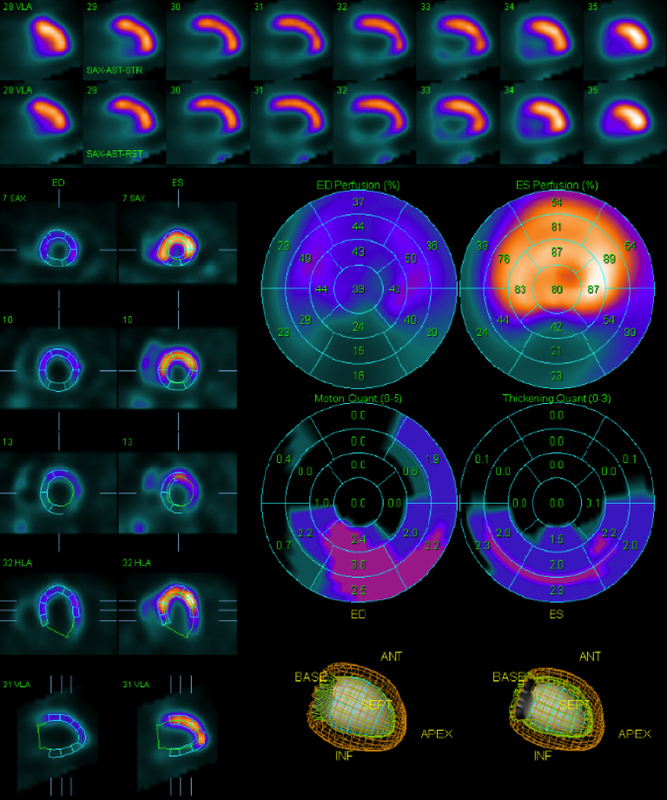 Standard myocardial perfusion spect protocols and associated patient radiation doses. Image Wisely, ACR November 2012. Ziessman HA, O’Malley JP, Thrall JH, Fahey FH. Nuclear Medicine: The Requisites. 4th Edition. Philadelphia: Elsevier; 2014. Golzar Y, Olusanya A, Pe N, et al. The significance of automatically measured transient ischemic dilation in identifying severe and extensive coronary artery disease in regadenoson, single-isotope technetium-99m myocardial perfusion SPECT. J Nucl Cardiol 2015;22(3):526-534. Holder L, Lewis S, Abrames E, Wolin EA. 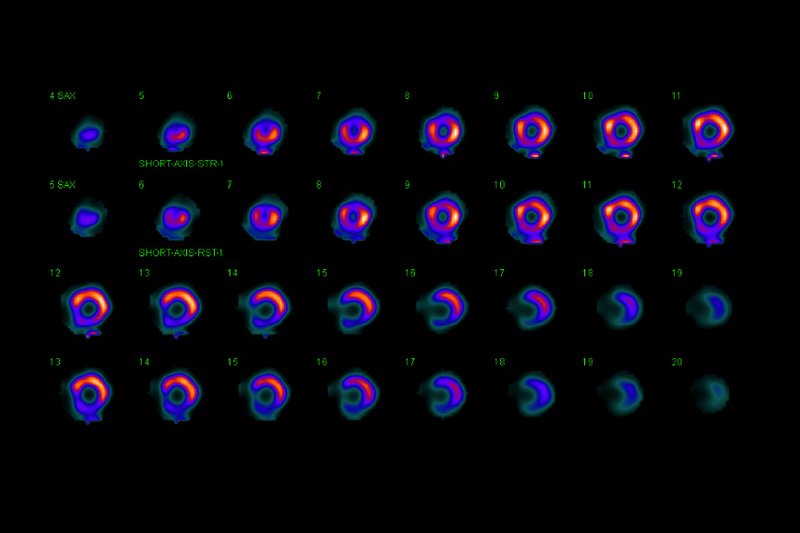 Review of SPECT Myocardial Perfusion Imaging. J Am Osteopath Coll Radiol. 2016;5(3):5-13. Lee Holder, D.O., Steven Lewis, M.D., Erik Abrames, M.D, Ely A. Wolin, M.D. Drs. Holder, Lewis, Abrames, and Wolin are with the Department of Radiology, David Grant USAF Medical Center, Travis AFB, CA.